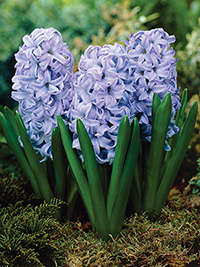 Light sky blue hyacinth, the perfect warm tone to soften your garden. Very fragrant. Early season flowering, 25 cm tall. Suitable for planting in pots or the garden. If planting in pots, keep the planted pot in a cool place until the shoots are 2-3cm high. A lack of winter cold may result in very short flowers in spring.